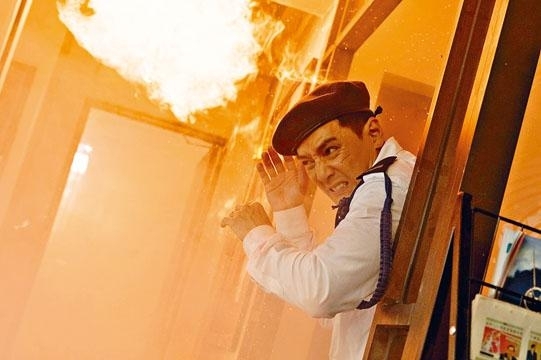 The Daniel Wu (Ng Yin Cho), Joseph Chang, Amber Kuo and Zhang Jingchu starred, Ringo Lam Lan Tung directed action film SKY ON FIRE (CHUNG TIN FOR) will open simultaneously in Hong Kong and China on November 25th. Earlier its first trailer was released with a series of thrilling car chases. It even spared no expense as a brand new Maserati was completely destroyed. SKY ON FIRE was Ng Yin Cho's return to Hong Kong film. On the second day of work Ng Yin Cho busted his nose when he personally performed a fight scene and was unconscious. "When I woke up it was like waking up in the morning. It was very comfortable, but when I saw the expression of all the workers I was very scared. Later I found out that I fainted." Ng Yin Cho's nose was broken. He never expected his co-star would bring him a bag of ice then directly straighten his nose. The next day he actually was able to continue to shoot to the surprise of many.